Saver 19 open with Yamaha 115 hp is beautiful boat and best pick for four member family or for couples who would like to enjoy in exploring hidden bays in Zadar archipelago or visit famous National Park Kornati. Boat have 115 hp Yamaha outboard engine with low fuel consumption. 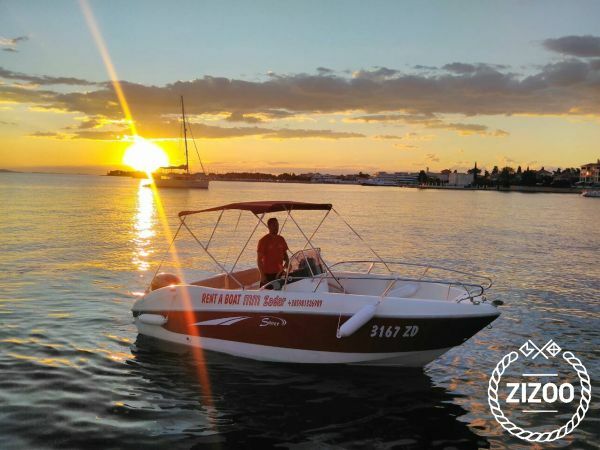 Boat is berthed in the middle of the Zadar bay only 10 meters from famous Harbor Cook-House˛& Club,so you can enjoy in good breakfast and coffee before start your adventure or drink good cocktail after return. Before your adventure starts boat owner will give you all info you want to know regarding good restaurants,beaches or small bays to visit. If you want to have THE BEST DAY in Zadar take a skipper with 20 years experience in this Arhipelago and just relax and enjoy your trip. Requested 42 times this week!